Trochoidal milling is a method of machining used to create a slot wider than the cutting tool’s cutting diameter. This is accomplished using a series of circular cuts known as a trochoidal tool path. A form of High Efficiency Milling (HEM), trochoidal milling leverages high speeds while maintaining a low radial depth of cut (RDOC) and a high axial depth of cut (ADOC). Trochoidal milling is largely based on the theory surrounding chip thinning in machining. Conventional thinking suggests that cutting tools have an optimal chip load that determines the ideal width and size of the chips produced. 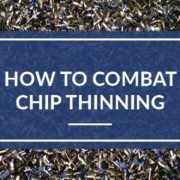 The concept of combating chip thinning involves machining with a chip load that is larger than “optimal” in order to maintain a constant maximum chip thickness. In contrast to a completely linear radial tool path in conventional machining, trochoidal milling takes advantage of a spiral tool path with a low RDOC to reduce load and wear on the tool (Figure 1). Trochoidal milling can be very advantageous in certain applications. The reduced radial engagement of the cutting edge decreases the amount of heat produced in the cut while also decreasing the cutting forces and load on the spindle. The reduced radial forces allow for greater accuracy during production and make it possible to machine finer and more precise features on a part. In addition, the lower radial depth of cut allows for a higher axial depth of cut, meaning that the entire length of the cutting edge can be utilized. This ensures that heat and cutting forces are distributed across the tool’s cutting edge, rather than concentrated on a single section. The reduced heat and wear, combined with their uniform spread on the cutting edge, result in significantly improved tool life over conventional slotting methods. Given the reduced destructive forces, the cutting tool’s speeds can be increased. Since the entire length of cut is utilized, trochoidal milling can eliminate the need for multiple axial depths of cut. Increased running parameters and a reduced number of passes greatly reduce cycle time. Since trochoidal milling uses a tool to machine a slot wider than its cutting diameter, the same tool can be used to create slots of varying sizes, rather than just one. This can free up space in your tool carousel and save time on tool change outs, depending on the requirements of the part (Figure 2). 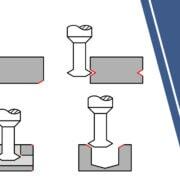 Although slotting is a roughing operation, the reduced radial depth of cut and decreased cutting forces from trochoidal milling often result in an improved finish over a conventional slotting toolpath. However, a finishing pass along the walls of the workpiece might be required to remove any cusps left from the spiral motion of the cutting tool. The challenges of trochoidal milling are typically found with the machinery and software. The right machine to take advantage of trochoidal milling will not only be capable of high speeds and feeds, but will also be capable of a constantly changing feed rate as the tool moves along it’s spiral path. 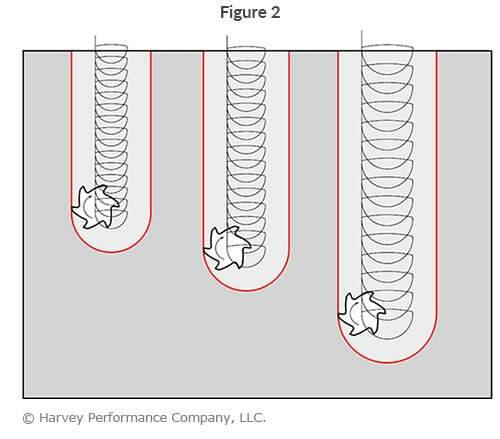 Inability to have a changing feed rate will cause chip thinning which can yield non-ideal results and potentially cause tool breakage. Special software might also be required to program tool paths and feed rates for this process. This is further complicated by factors like the ratio of the cutter diameter to the size of the groove, as well as the radial depth of cut for these different ratios. Most figures suggest the cutter diameter be 50%-70% of the final slot width, while the radial depth of cut should equal 10%-35% of cutter diameter (Table 1), but the safest option is always to consult the tool manufacturer. Micromachining can also benefit from trochoidal milling. The decreased radial engagement and lower cutting forces produced during a trochoidal tool path put less force on the cutting tools. 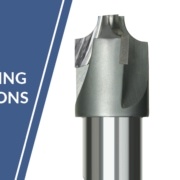 This is especially important for smaller diameter tools, as they are weaker and less rigid, and the reduced cutting forces decrease the chance of deflection and breakage. While trochoidal milling with miniature tooling is theoretically beneficial, there are additional challenges associated with smaller tools. 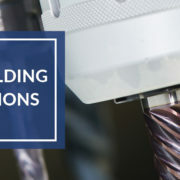 Miniature cutting tools are much more susceptible to breakage due to spindle runout and vibration, material inconsistencies, uneven loading, and many other variables that arise during machining. Depending on your application, it may be worth using the tool with the greatest diameter for the extra strength. Although there are potential benefits at the miniature level, more attention must be paid to the machine setup and material to ensure the tools have the highest chance of success. Just like HEM, as a general rule, trochoidal milling should not be considered when using tools with cutting diameters less than .031”. 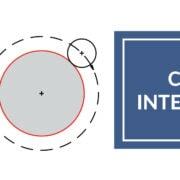 While possible, trochoidal milling may still be prohibitively challenging or risky at diameters below .062”, and your application and machine must be considered carefully. 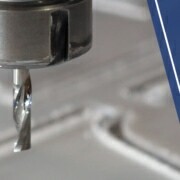 Trochoidal milling is a High Efficiency Milling technique (high speed, high ADOC, low RDOC) characterized by a circular, or trochoidal, tool path. This milling style is proven to offer significant machining process benefits, such as increasing tool life, reducing machining times, and fewer tools required for a job. 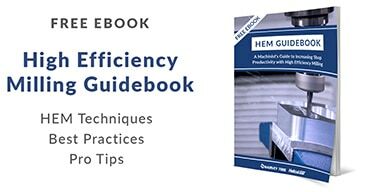 However, it is critical to have a machine and software capable of high speeds and feeds and constantly changing feed rates to avoid critical tool failure. While miniature tools can still benefit from trochoidal milling, the risk of tool breakage must be considered carefully, especially at cutter diameters below .062”. Although trochoidal milling can increase your machining efficiency in many applications, it is always a good idea to consult your tool manufacturer beforehand. A great example of trochoidal milling in action can be seen in this video, where a 1/2″ Helical Solutions end mill with variable helix, variable pitch was used to machine a block of 316 stainless steel. Putting less force on the cutting tool would be an important part of ensuring that your equipment can last for a long time. I would think that the parts needed for mechanical milling could be hard to come by or be expensive if not treated properly. By being able to reduce the stress you place upon it then you would be able to keep it running more efficiently for longer and that would help you both make more and save money. I also like the trochoidal milling method on my machine. Low cutting forces provide long-lasting tools. This means trochoidal milling is a good strategy in order to machine your part efficiently without changing your tools too often.